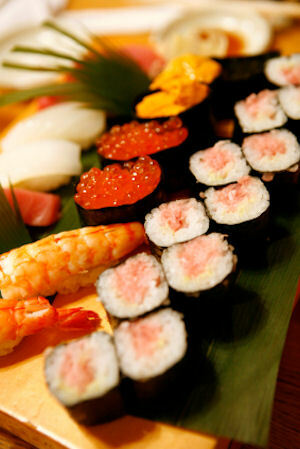 Not all sushi rolls must have seafood inside; many do not, in fact. This recipe uses cooked sweet potatoes, which impart a sweet, creamy quality, and raw cucumbers, which give a contracting crispness to the rolls. Use white or black sesame seeds for an elegant finishing touch. In a large mixing bowl, combine the rice vinegar with the sesame oil. Add the cucumber strips, stirring gently, and allow to marinate for about 4 hours. Remove from the marinade and drain. With a blender, whip the sweet potatoes until they are smooth and creamy. Lay a piece of plastic wrap on a flat surface. Place half a cup of rice on the plastic wrap and press to the size of a sheet of nori. Place a sheet of non on top of rice, then spread ¼ cup of blended sweet potatoes on nori and sprinkle with sesame seeds. Place ¼ cup cucumber strips in the middle. Roll up from the outside and dampen the edge to seal (the rice will be on the outside of the roll). Allow to chill for at least 3 hours before slicing. Slice with a damp knife into half-inch thick slices. Serve cold. Very tasty! This roll is a nice, interesting experience over and above plain kappamaki. I like fish rolls, but sometimes it's nice to mix it up, and I have some vegetarian (or just squeamish) friends I like to fix sushi for. This is a hit! This is such a nice recipe. I have these all the time as I am vegan, and they make for a great pre-prepared snack. Adding a little bit of salt when cooking the rice is delicious! Average rating of 4.25 stars based on 4 reviews. Summary: Not all sushi rolls must have seafood inside; many do not, in fact. This recipe uses cooked sweet potatoes, which impart a sweet, creamy quality, and raw cucumbers, which give a contracting crispness to the rolls. Use white or black sesame seeds for an elegant finishing touch.